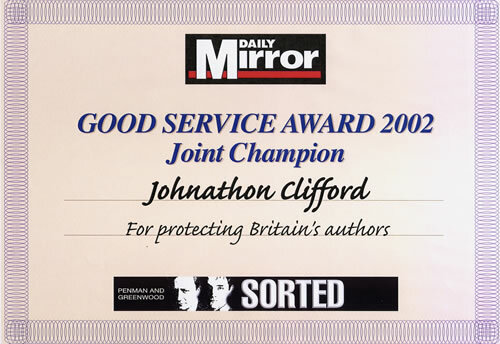 In 2002, I was thrilled to be awarded Joint Winner of the Daily Mirror "Good Service Award" for protecting the rights of Britain's authors. To have my efforts at stamping out the less favourable practices that occur within Vanity Publishing acknowledged in this manner was truly gratifying. As I have stated elsewhere, I receive no salary or recompense in pursuing my campaign, nor do I seek any, so when a daily newspaper like the Mirror actually offers its congratulations in this manner - well, I'm sure you can imagine just how happy I was. What makes this award doubly pleasing to me is that it was granted jointly to myself and Trevor Baylis OBE (the inventor of the clockwork radio).